Let's consider for a moment a few of the other relative factors that seems to have developed into such a 'hot topic' in Scottish salmon fishing in recent decades. The entire 'catch statistics' theme has certainly become the 'thorn in the bottom' of something as glorious and naturally unpredictable as Scottish salmon fishing. 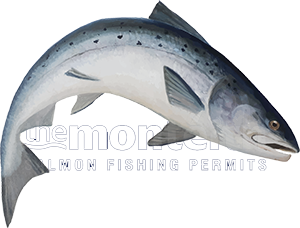 If you're a salmon fishing agent who lacks flair with nothing more than an interest in a small commision for taking an order online because an estate hasn't had the inclination to sell it's own online rod availability then I can partially understand this selling concept. To my mind it just seems very thoughtless to base any beautuiful Scottish salmon river's main selling point on a digit which is not created by consistent or equal fishing pressure. With this thoughtless marketing approach comes a 'trap' which can cripple an estate's salmon fishing permit rod sales through naturally ocurring low salmon stock periods and nor have I ever been contractually assured that a salmon would be guaranteed to cooperate in over 40 years of pursuing them. I've also seen pools absolutely stuffed with hundreds of salmon with none of them prepared to take a salmon fly regardless of how well the fly is presented so why are these fish not considered. If the fishing management in Scotland want to ever get a true grip of the Scottish salmon stock position they need to invest in the latest high tech fish counting equipment for the 'main stem' rivers of Scotland and stop fiddling about with the tributaries. I can hear the excuses already but come on boys & girls isn't this the most logical approach to find a salmon river's true stock position (if you really must know) rather than allowing a heavily flawed 'catch statistics' concept based on individual angler's fishing ability (or attendance records) to lead the way. If we can invest billions annually in high tech weaponary to kill then surely we can invest a little in the effective stock management of God's finest aquatic creation that is so important to Scotland and other nations of the northern hemisphere. Whether our tinkereing with the planet through emissions or deliberate geoengineering is to blame for climate change or whether we are entering a natural global re-occuring pole shift era wouldn't it be worthwhile to know our exact wild Atlantic salmon stock position via hard factual fish counter evidence for effective stock management purposes. At what point in this industry do we hire people who can really make a difference and who can think outside the box and who are allergic to the 'red tape' that has hindered Scottish salmon fishing for decades. Sure there are a few superstars in Scottish salmon fishing management already but the bulk of them are from what I've personally seen largely unproductive or completely stiffled with bureaucracy. It's not really any different on the riverbanks either as many of the salmon fishers who come to the Scottish rivers are completely 'self taught' to a varying degree of skill. The fisher who can turn up knowing how to hook a salmon confidently under any river condition are as rare as hen's teeth which is fine as salmon fishing should cater for all levels of skill and competence of salmon fisher. For goodness sake though please do not be so daft as to make 'catch statistics' a reliable factor as to whether a salmon beat is worth fishing or not as salmon will often surprise you. When salmon stock numbers are running low there's more of a challenge and as we are mainly operating a sensible 'catch & release' code these days so anglers are not fishing for food like was previously the case. De Beers don't flood the market with diamonds but instead release these tiny stones slowly from their vast stockpiles. If they didn't do this the value would fall out of these little pieces of carbon. How could anyone with half an eye for natural beauty compare the natural 'live' magnificence of a fresh run Scottish salmon to a little sparkly stone let alone compare it to the adrenalin release involved in catching that salmon.